When the copy machine was distributed to businesses back in the 1950s, it enabled office workers to keep copies of their printed materials. In addition, the government started expanding its regulations, requiring businesses to create and keep records. Not much has changed in the last 60 years; employees are still printing documents and filing paper. And sadly many businesses are still relying on outdated lateral file cabinets to store all this paper. 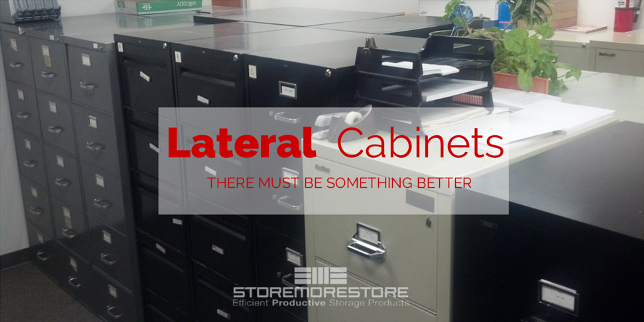 You might be stuck using lateral file cabinets because people are usually resistant to change. 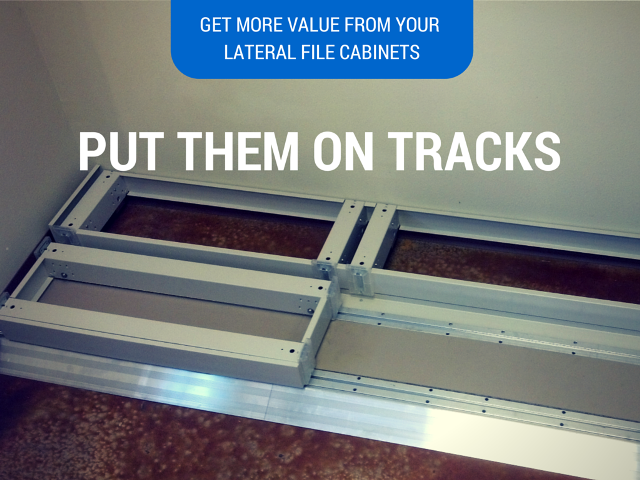 But, there is a way to get more value out of your lateral file cabinets – put them on tracks. How Does Putting Lateral Cabinets on Tracks Work? Here’s an example: one row of 3 file cabinets is placed up against the wall. In front of these cabinets, tracks are laid down on the floor. Another row of 2 file cabinets is placed on the tracks. To access stored files in the back row, you move the cabinets in the front row side-to-side, getting them out of the way to give you access to that back row. Saves Space– With the rows of cabinets compacted together in this arrangement, you’re using less floor space to store the same amount of files. Centralizes Storage– If you have a smaller storage space, putting the lateral cabinets on tracks centralizes your file storage area. Improves Organization– Because files are stored together, your office is better organized. And frequently used files can be kept closer to employees. Increases Productivity– Employees will spend less time searching for files in multiple locations. 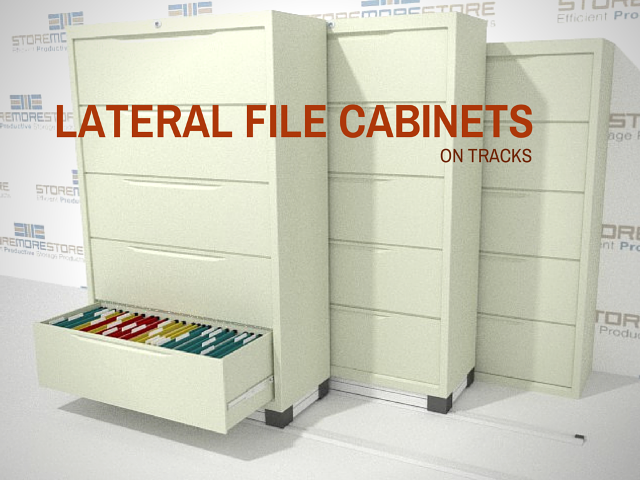 Where Can You Find Lateral File Cabinets on Tracks? 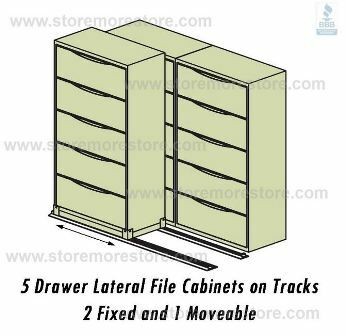 You can find the lateral file cabinets on tracks from us at StoreMoreStore. We have a variety of different configurations and colors for you to choose from. And if you have any questions or need any help, give us a call at 1-855-786-7667. 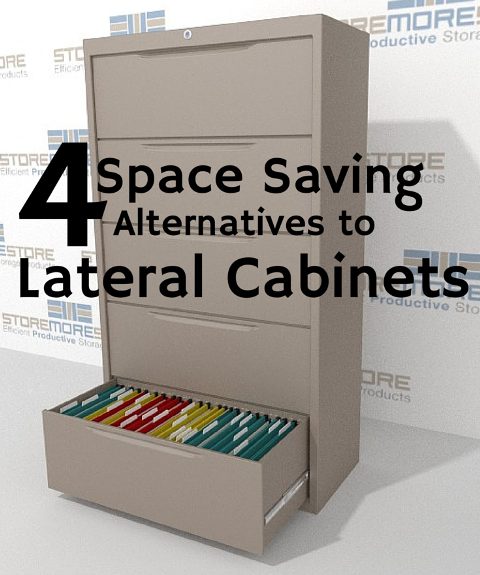 Are you tired of the lateral file cabinets in your office? Pulling out the drawers and having them get stuck on the way back in. The fact that no two cabinets are the same color, yet somehow every color is drab and dull. And of course the reason most of us hate them – they take up so much space! There’s something better you should be using instead of lateral cabinets: flipper door file cabinets. Here are 5 reasons you should use flipper door file cabinets in your office. 1. More Storage Capacity: The flipper door file cabinets offer 60% more folder storage capacity in the same space as lateral file cabinets. 2. Extra Space Savings: Flipper door file cabinets extend higher than traditional lateral cabinets to use extra vertical space as storage space. 3. Mobile Arrangement: When you put the cabinets on tracks to create a mobile arrangement, you will save even more space. 4. Locking Capabilities: The doors on the cabinet are lockable to secure your stored files and keep you in compliance with HIPAA. 5. 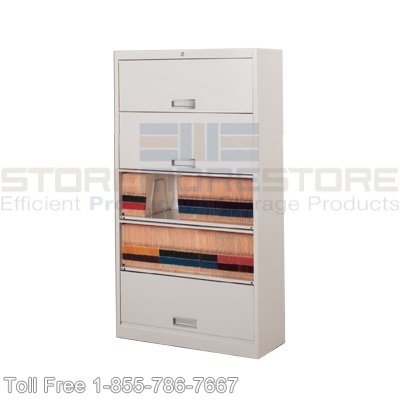 Filing Options: With the flipper door file cabinets you can use a more efficient color-coded end tab filing system. All these reasons add up to one big reason: cost-efficiency. By gaining more storage capacity, maximizing your space, and implementing a better filing system, your business will become more cost-efficient. And who doesn’t want that? Also, how easy is it that you can accomplish all this with a storage cabinet!? Are you ready to make the smart investment in flipper door file cabinets? Great! 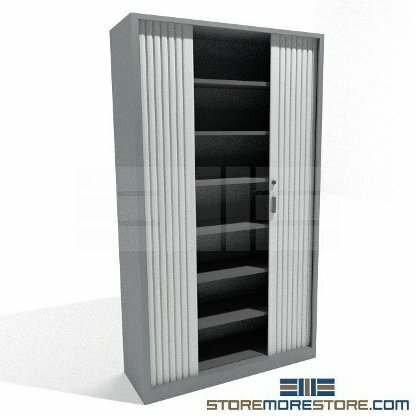 You can find all sizes, colors, and arrangements of flipper door file cabinets at StoreMoreStore. If you have any questions or need help, call 1-855-786-7667. Lack of storage space is a recurring problem many offices experience. Files, documents, and records are spread out all over the building in any corner with a little space available. This situation causes employees frustration because they are spending their time searching for information they need instead of actually working. 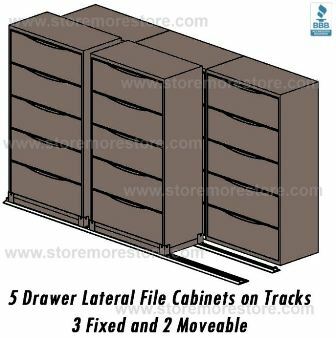 Our solution to solve both space and organizational problems is Sliding Lateral File Cabinets on Tracks. 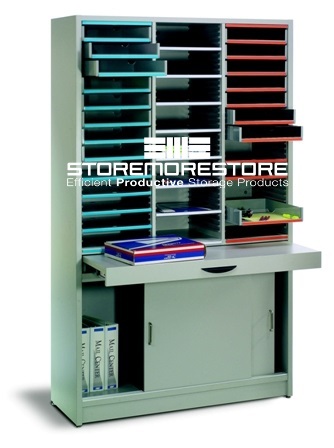 This storage system consists of two rows of lateral file cabinets. 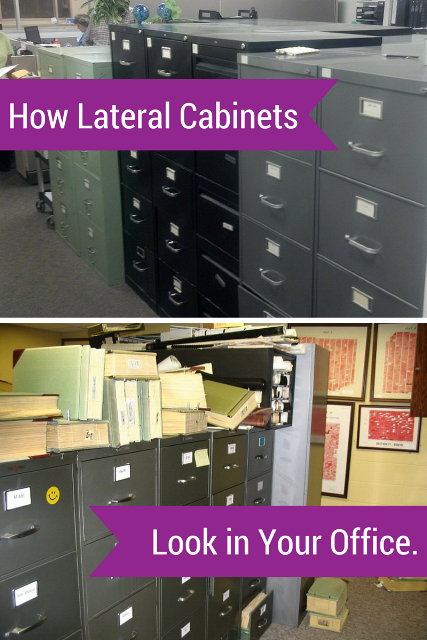 The front row of lateral file cabinets are placed on tracks and slide back and forth to provide access to the back row of stationary lateral file cabinets. The result of this double deep arrangement is an increase in storage capacity in less floor space. Also, retrieving information is easier and quicker because the Sliding Lateral File Cabinets on Tracks centralizes stored files, documents, and records. 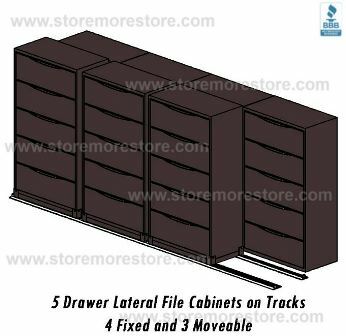 To make the most out of a Sliding Lateral File Cabinets on Tracks system, store rarely used inactive files in the back cabinets while keeping active files in the front sliding cabinets. This will reduce the need to move cabinets to access files, which will further increase productivity. 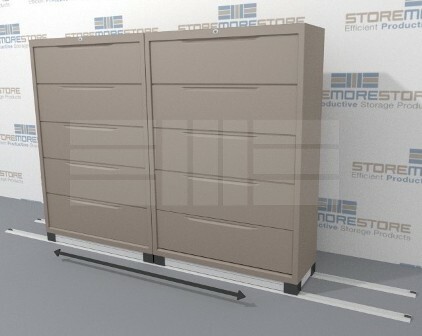 Shop online now at StoreMoreStore to see all of our available sizes and configurations of Sliding Lateral File Cabinets on Tracks! If you can’t find what you are looking for or have questions about how you can use your existing lateral file cabinets on the track system, give us a call at 1-855-786-7667.